For the sculpture referred to as the "Florentine Pietà", see The Deposition (Michelangelo). For the one now in Milan, see Rondanini Pietà. The structure is pyramidal, and the vertex coincides with Mary's head. The statue widens progressively down the drapery of Mary's dress, to the base, the rock of Golgotha. The figures are quite out of proportion, owing to the difficulty of depicting a fully-grown man cradled full-length in a woman's lap. Much of Mary's body is concealed by her monumental drapery, and the relationship of the figures appears quite natural. 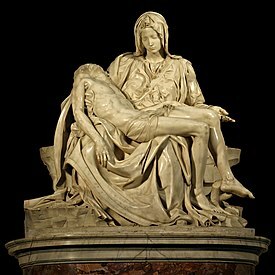 Michelangelo's interpretation of the Pietà was far different from those previously created by other artists, as he sculpted a young and beautiful Mary rather than an older woman around 50 years of age. The marks of the Crucifixion are limited to very small nail marks and an indication of the wound in Jesus' side. Christ's face does not reveal signs of the Passion. 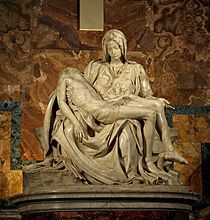 Michelangelo did not want his version of the Pietà to represent death, but rather to show the "religious vision of abandonment and a serene face of the Son", thus the representation of the communion between man and God by the sanctification through Christ. The Madonna is represented as being very young for the mother of an approximately 33-year-old son, which is not uncommon in depictions of her at the time of the Passion of Christ. Various explanations have been suggested for this. One is that her youth symbolizes her incorruptible purity, as Michelangelo himself said to his biographer and fellow sculptor Ascanio Condivi. Another explanation suggests that Michelangelo's treatment of the subject was influenced by his passion for Dante's Divina Commedia: so well-acquainted was he with the work that when he went to Bologna he paid for hospitality by reciting verses from it. In Paradiso (cantica 33 of the poem), Saint Bernard, in a prayer for the Virgin Mary, says "Vergine madre, figlia del tuo figlio" (Virgin mother, daughter of your son). This is said because, since Christ is one of the three figures of Trinity, Mary would be his daughter, but it is also she who bore him. Sculpting of the work took less than two years. Following completion, the Pietà's first home was the Chapel of Santa Petronilla, a Roman mausoleum near the south transept of St. Peter's, which the Cardinal chose as his funerary chapel. The chapel was later demolished by Bramante during his rebuilding of the basilica. According to Giorgio Vasari, shortly after the installation of his Pietà, Michelangelo overheard (or asked visitors about the sculptor) someone remark that it was the work of another sculptor, Cristoforo Solari, whereupon Michelangelo signed the sculpture. Michelangelo carved MICHAELA[N]GELUS BONAROTUS FLORENTIN[US] FACIEBA[T] (Michelangelo Buonarroti, Florentine, made this) on the sash running across Mary's chest. The signature echoes one used by the ancient Greek artists, Apelles and Polykleitos. It was the only work he ever signed. Vasari also reports the anecdote that Michelangelo later regretted his outburst of pride and swore never to sign another work of his hands. 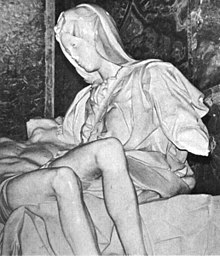 In 1964, the Pietà was lent by the Vatican to the 1964–65 New York World's Fair to be installed in the Vatican pavilion. Francis Cardinal Spellman, who had requested the statue from Pope John XXIII, appointed Edward M. Kinney, Director of Purchasing and Shipping of Catholic Relief Services - USCC, to head up the Vatican Transport Teams. People stood in line for hours to catch a glimpse from a conveyor belt moving past the sculpture. It was returned to the Vatican after the fair. Subsequent to its carving the Pietà sustained much damage. Four fingers on Mary's left hand, broken during a move, were restored in 1736 by Giuseppe Lirioni, and scholars are divided as to whether the restorer took liberties to make the gesture more 'rhetorical'. The most substantial damage occurred on May 21, 1972, (Pentecost Sunday) when a mentally disturbed geologist, the Hungarian-born Australian Laszlo Toth walked into the chapel and attacked the sculpture with a geologist's hammer while shouting "I am Jesus Christ; I have risen from the dead!" With fifteen blows he removed Mary's arm at the elbow, knocked off a chunk of her nose, and chipped one of her eyelids. Onlookers took many of the pieces of marble that flew off. Later, some pieces were returned, but many were not, including Mary's nose, which had to be reconstructed from a block cut out of her back. After the attack, the work was painstakingly restored and returned to its place in St. Peter's, just to the right of the entrance, between the Holy door and the altar of Saint Sebastian, and is now protected by a bulletproof acrylic glass panel. ^ "Chapel of the Pieta". Retrieved 2009-10-28. ^ "Pietà by Michelangelo St. Peter in Vatican Rome". Romaviva.com. Retrieved 2014-05-18. ^ Pope-Hennessy, John (1970). An Introduction to Italian Sculpture: Italian High Renaissance and Baroque sculpture (3 ed.). Phaidon. p. 304. ^ "The Pieta by Michelangelo". www.statue.com. Retrieved 7 April 2017. ^ "The Divine Michelangelo – overview of Michelangelo's major artworks". BBC Press Office. Retrieved 2008-12-08. ^ Aileen June Wang (2004). "Michelangelo's Signature". The Sixteenth Century Journal. 35 (2): 447–473. doi:10.2307/20476944. JSTOR 20476944. ^ "1964 New York World's Fair 1965 – Attractions – Vatican – Page Four". Nywf64.com. Retrieved 2014-05-18. ^ "Time Essay: Can Italy be Saved from Itself?". Time Magazine U.S. Time Inc. June 5, 1972. Retrieved 26 August 2012.